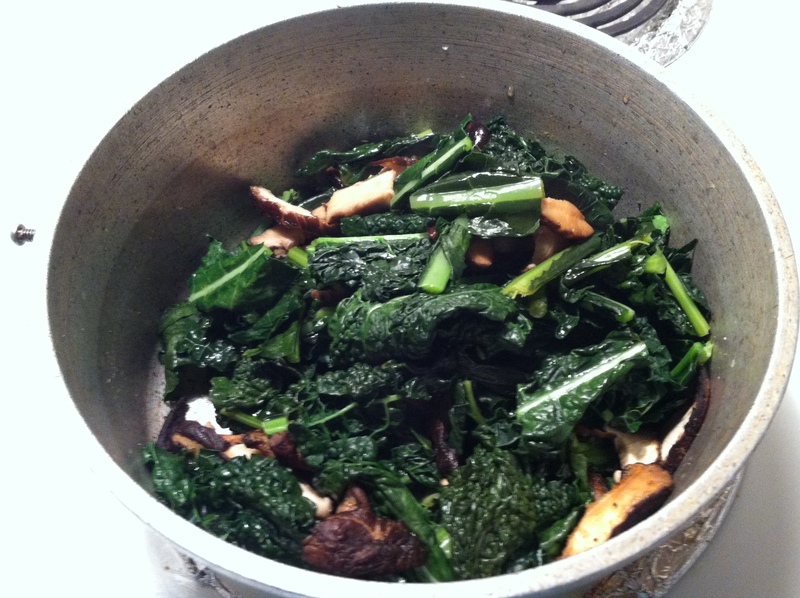 Since making this blog, I’ve realized how very DYI I am about learning to cook. I was never taught, so much as expected to reverse engineer a meal based on what I’m tasting. My mother was a single mother so she needed kids who were inherently independent so by the time I was 10, if there were groceries in the fridge, I could figure something out. This mindset really affects how I present information on the blog. It also affects my approach to recipe construction, especially when it comes to spices. My concept of purchasing and using spices is based entirely on how my mother operates her kitchen. First, I’m not use to running out of seasoning. I’m not saying it never happens, but when it does, there is always this moment of slight confusion about how on Earth this could happen. For instance, I recently ran out of regular black pepper, but I also have other types of pepper like lemon pepper and garlic pepper, so it wasn’t a big deal. I ran out of plain salt and immediate went to the store because I felt it was unacceptable. Second, I’m accustomed to having a diverse group of spices in my cupboard. My mother would buy spices all the time, even if she rarely used them. So even though I have rarely if ever tasted a meal that required dill, rest assured its sitting in her kitchen. (Side note, we have spices that predate the birth of my youngest brother.) There is only one recipe that I use either nutmeg or cumin for, but I still insist on having it in the house. With this is mind, I decided to use recipes that would recycle the spices used in prior recipes or at least only require ones that most people already have. This recipe started because I was experimenting with different salad dressings. What I ended up making tasted okay on a salad, but I felt that it would make a better marinade than anything else. By the way, it could be used as a dressing or a marinade for almost anything. To prepare the marinade, mix all the ingredients (expect the salmon, naturally) together. I used a recycled glass salsa jar because I don’t always like to use all of the marinade. Make sure to give everything a good shake because you’ll want this mixture to be constant. Once that is complete, align a cooking sheet with enough foil for the sauce and the fish. 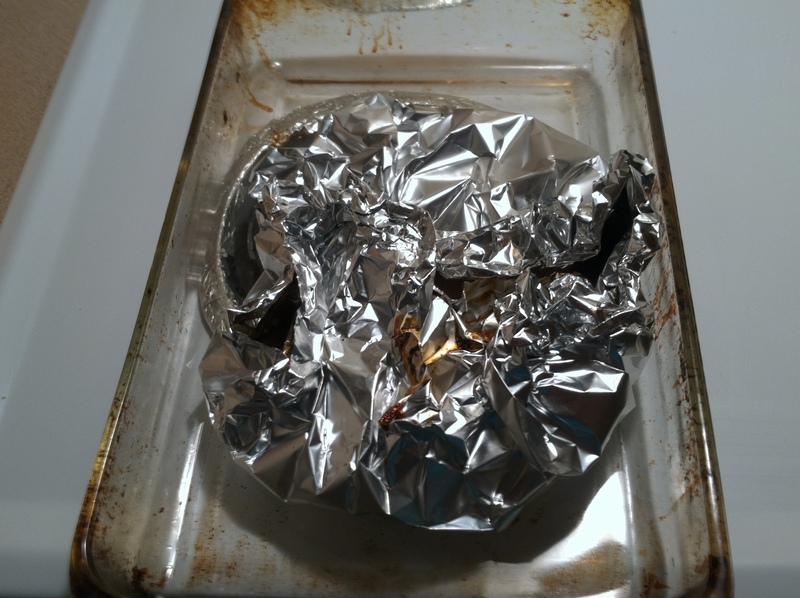 Make sure there is enough foil to enclose all of the salmon. 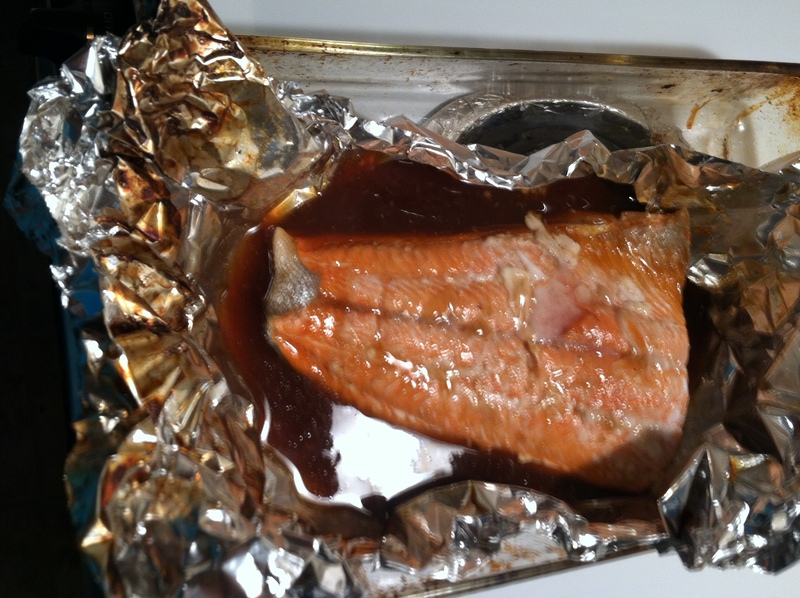 Pour in at least half of the mixture onto the salmon and close up the foil, more if you have more fish. Bake for at least 15 minutes. If the salmon was frozen when you put it in the oven, expect it to take at least 30 minutes. Either way, after the 15 minute mark, check it every five minutes or so until it is at your preferred state of doneness. You can discard the marinade if you would like, but I prefer to store fish in it to help preserve the flavor. Plus, when I do actually use the salmon for a salad, I sprinkle a little of the marinade on the leaves in leu of dressing. Okay, so the Kale Salad part of that title is a bit of an over statement, I admit that. This recipe is a combination of two recipes with the parts that I actually and willing to eat blended together. 2 Bushels of Kale: I’m not sure if I’m using the right word here. However they are clumped together, grab two. 1 Package of Mushrooms: I have a real preference for shitake just because I love the texture. Chop the mushrooms and place them onto a baking sheet. Sprinkle on olive oil, salt and pepper. Cook for about five to ten minutes. Combined the chopped kale with the water and cook over a medium heat. The goal here isn’t to get the kale soggy, but to just loosen it up. Keep stirring and cooking the kale until all of it is a deep shade of green that still has some bite to it. Cut the lemon in half and squeeze one half of it onto the kale. Stir for a few seconds more to make sure the lemon juice is evenly spread throughout the leaves. Taste the mixture before you decided to add in more lemons juice because an entire lemon can be overpowering for some. Add in the mushrooms and stir a few more times before removing from the heat.